There are many circumstances that compel a biblical scholar to publish as much as humanly possible, but last night I read a handful of good reasons not to publish. In a letter to Wolfgang Capito, dated July 9th, 1537, Luther informs Capito of his wish not to have his works published. 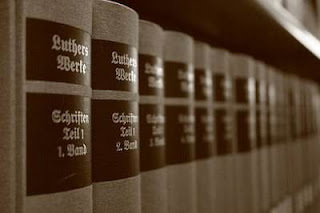 Luther says, "Regarding [the plan] to collect my writings in volumes, I am quite cool and not at all eager about it because, roused by a Saturnian hunger, I would rather see them all devoured." (LW 50, 171-173). 1) his worry that reading his works might reduce the study of Scripture. 2) his realization that some of his writings originated in temporary, restricted circumstances. 4) his conviction that writings by other theologians were more significant than his own writings. 5) his realization that such an edition would be so expensive that the edition would collect dust in libraries, and only the rich could afford to buy it, while the common man could by no means afford it.